One of the greatest and most emotional challenges for a genealogist specializing in Jewish research is finding family lost in the Holocaust. AncestryProGenealogists engages resources from around the world to solve an Eastern European puzzle. Minnie Stein rarely spoke to her children or grandchildren about the relatives in Europe to whom she wrote. About 40 years after her death, her family began to look for clues to identify the mystery family. All they thought they knew was that they were related to the Steins and perhaps lived in Nancy, France. One granddaughter remembered taking letters written in French to the French teacher at her high school for translation – neither Minnie nor anyone else in the family spoke French. Minnie was born in Johnstown, Pennsylvania, in 1897. Her grandparents, Morris and Essie Chaia, had immigrated to the United States from Lithuania sometime between the 1881 birth of their seventh child there, and the birth of their eighth child in Pennsylvania in 1888. The family story was that three of Morris’ siblings came to the United States, while his two remaining siblings died in Europe. Of Morris’ nine children, five could be accounted for in the U.S. Because of the ages of the remaining, it was assumed that they had died in childhood in Europe. Only one death could be confirmed. Could these French relatives be the descendants of one of these other children? The only clues were two photographs. One was dated 1921 and identified “Maurice, the bride, and mother.” There was no surname and no place. The second photo was of three girls who appeared to be teenagers. 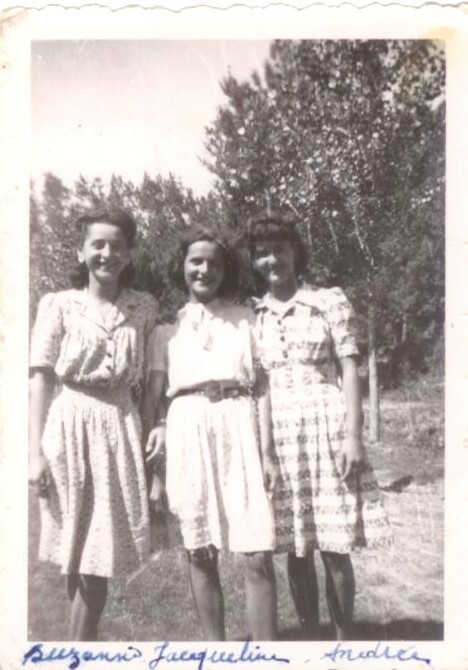 The names “Andrée, Jacqueline, and Suzanne” were handwritten on the front of the photo. There was no place or surname. The back of the photo had a year, 1944, written. A search throughout France turned up one possible man named Maurice Stein, but it became clear after communicating with his descendants that he was not the Maurice in the photograph. Minnie’s descendants were asked to search through any boxes of papers which they might have. Miraculously, in a box hidden in a corner, mingled with 40-year-old income tax forms, was an envelope from someone in Nancy, France. The return address on the envelope indicated that it was from someone whose surname was Metzinger. This was not a surname with which anyone in the family was familiar. There were two letters in the envelope – one was from a woman named Berthe, the other from someone named Andrée. Could this be the Andrée of the photograph? The letters were dated 1966, the year before Minnie died. The content of the letters was personal and without context, providing no meaning. A search through directories did not reveal anyone named Maurice, Berthe or Andrée Metzinger. On-site research of the archives in Nancy did not reveal any information – but how could it? After all, archives are often not indexed, and without knowing a year of any event, it would be nearly impossible in a large city, such as Nancy, to locate a person without more information. We had the year of the wedding photograph, but it didn’t seem to be enough. Another search sought information about Maurice, Berthe or Andrée Stein, but it had no more success than the earlier search. Repeated conversations with the family members jogged the memory of one of Minnie’s nephews who, unlike his cousins, was an adult when the correspondence was going on. He suggested that it wasn’t Minnie who held the clue to the French relative’s identity, but rather Minnie’s mother, Annie Jablonsky. The Jablonsky and Stein family histories were deeply intertwined. Nathan Stein married Annie Jablonsky. Annie’s parents were Wolf Jablonsky and Esther Stein. 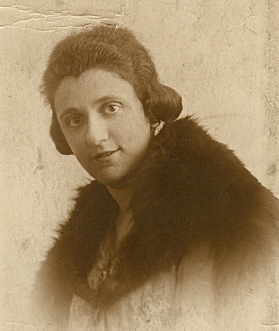 Annie’s maternal grandparents were Lazar and Minnie Stein. Nathan’s grandparents were also Lazar and Minnie Stein. The Jablonsky family, like the Steins, were from Lithuania. Wolf and Esther had seven children, four of whom emigrated with their parents, while two died in early childhood in Europe. The fate of Abraham, the seventh child, had never been found. A return to the Nancy archives was clearly in order. This time, the surnames searched were Jablonsky and Metzinger. We began with the information on the wedding photograph again, and this time struck gold. 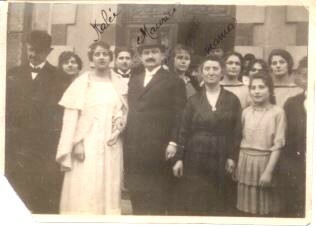 A document was located for the birth of a Moise Jablonski, the son of Abraham Jablonski and Mina Levitas. A note in the margin recorded the marriage in 1921 of Moise to Renée Schwab. The families had roots, not in Nancy itself, but in the town of Nomeny. Nancy is the capital of the Meurthe-et-Moselle department, and Nomeny is a small town in Meurthe-et-Moselle. Further research revealed the birth records for Andrée, Jacqueline, and Suzanne – the daughters of Maurice Jablonski and Renée Schwab. Those same records were the repository for the birth of Maurice’s sister, Berthe, his brother Lazar, and the 1891 French census identifying the Jablonski family. 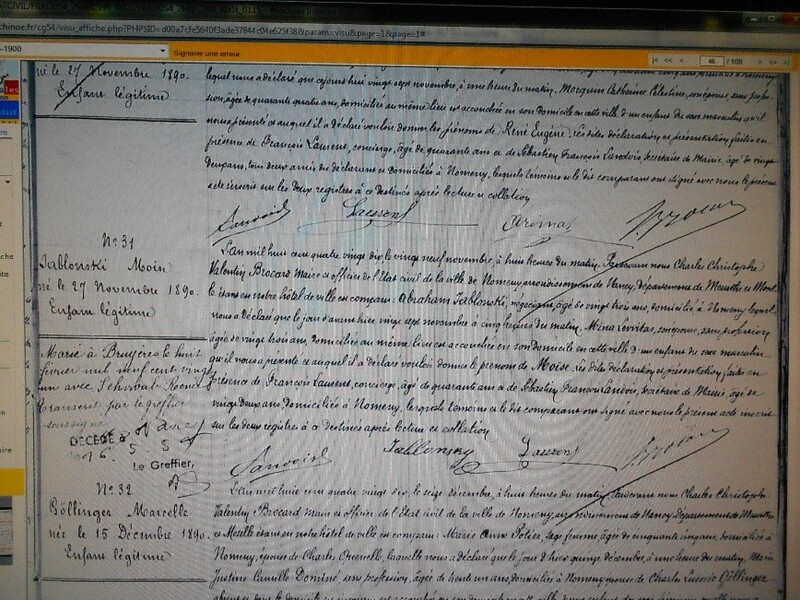 Birth, marriage, and death records for the family were ultimately identified and copies acquired. A 2005 book that documented the Jewish community of France from 1870-1945 listed the names of the Jews of Nancy who had survived World War II. Maurice, his daughters and his wife were among the survivors! The biggest surprise was the discovery of death records of Jacqueline and Suzanne, but not for Andrée. She was located in a telephone directory, and a phone call was placed to her. Photographs were exchanged, and they dispelled any doubt that this was a relative of Minnie’s. Maurice was Minnie’s male counterpart, and Andrée was a twin of one of Minnie’s sisters. 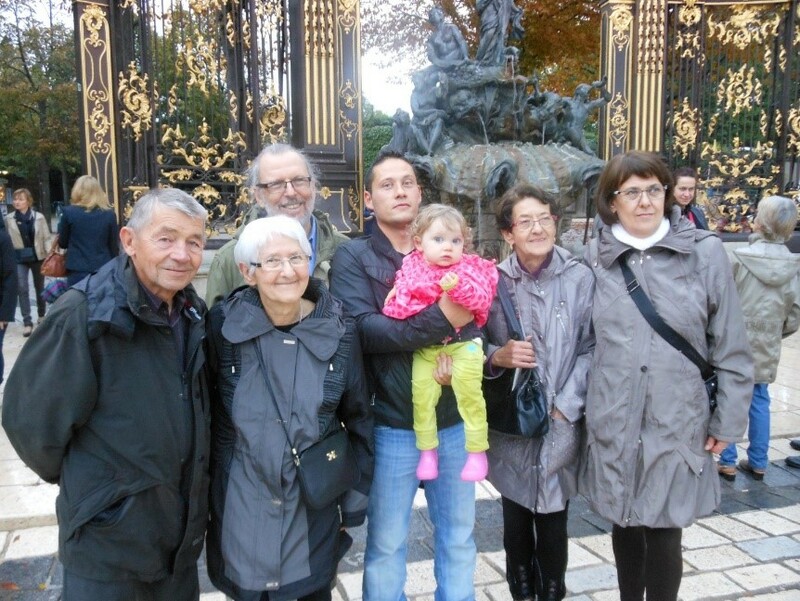 In 2014, I was privileged to accompany one of the grandchildren on a trip to Nancy, France, for a family reunion.